The 5 Point: Seattle’s Hangover Cause and Cure. Oh, Seattle. Its grunge past constantly coming back to haunt it amid Space Needle-seeking tourists whose only definition of the word is a short one…something about some band called Nirvana. Its rumored suicide rate pulling visitors in to only visit, rather than play games with their own rain-spawned potential depression. Those living in Seattle know better than to buy into glamorous melancholy. Some of them even saw Nirvana back in the day and embrace almost any genre more warmly than ‘grunge’. They know that at Seattle’s root, the influx of alternative music in the early ’90’s and the post-Cobain suicide awareness play very little role. They don’t have to share Seattle’s secrets with you; but I will. I don’t live there. I hardly live anywhere. It’s my job to point you in directions locals would selfishly steer you away from. There’s a place in Seattle where you can see the Space Needle and listen to that infamous ’90’s music…all while destroying a plate of french fries doused in brown gravy and sipping a beer. The 5 Point. 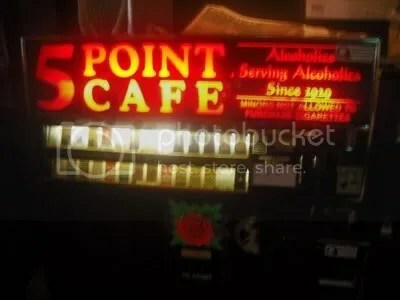 The 5 Point is a restaurant, bar, used-to-be laundromat, located at 2214 1st Ave. “Alcoholics serving alcoholics since 1929” reads the sticker on the cigarette machine. Bras hang from the head of a moose nearby. Concert posters decorate the walls near the bathroom and for all intents and purposes; this is a dive bar/restaurant. One you should dive into. (Corny? I don’t care). Serving breakfast all day long, my friend, Ben, ordered a monstrous meal for $10 which supplemented his small figure with 2 huge pancakes, bacon, sausage, and eggs. This kind of meal is served on two plates. 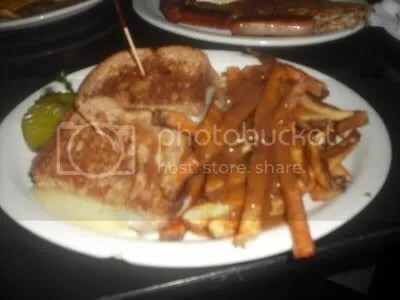 I dipped my swiss grilled cheese into my bowl of extra gravy that the waitress graciously brought to me when I let her know the sprinkle of gravy on my fries just wouldn’t cut it. 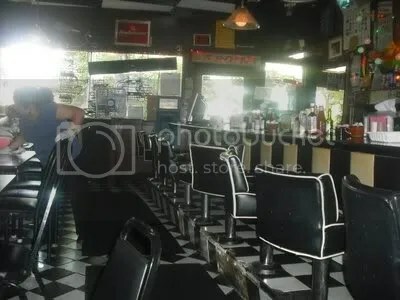 I sat in the dark corner of the hidden-in-plain-view spot and my heart skipped a beat when my favorite band came roaring through the jukebox. 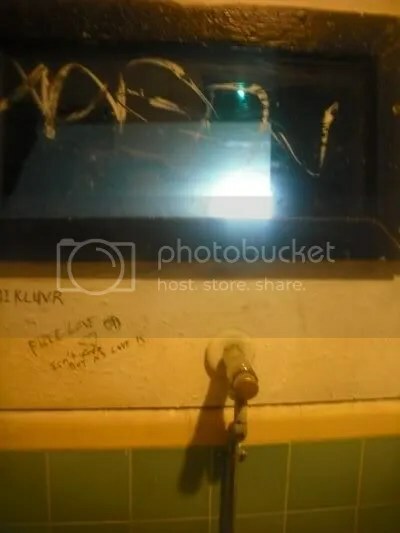 You can listen to Queens of the Stone Age here while dipping a grilled cheese in gravy, sipping a beer, and when you have to piss (men), you can proceed to do it in a urinal that comes equipped with an overhead tunnel view straight to the Space Needle. Comfort food and alcohol served decadently 24/7. WTF else could you ask for? I absolutely love this post, Elizabeth! It’s so witty and true- I love the “glamorous melancholy”… so true. 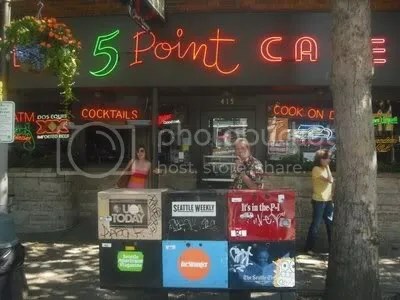 The correct address for the 5 Point is 415 Cedar, not 2214 1st Ave.
5 points cafe should seriously consider getting a waitress who doesn’t assault a customer for requesting his order be taken after waiting patiently for an hour. He was not drunk, nor on drugs, nor harassing her.. he simply requested she take our order finally.. as they were already bringing food out to the rest of our party. You do not shove a customer! Maybe he resembled an ex boyfriend of hers or something.. i don’t know… but our son is her age and that just angered me more. It was simply uncalled for and extremely rude. While we would love to try the food.. she has to go first!!! I’m a little confused, Mrs. Brockett. Can you tell us what exactly happened at 5 Points Cafe to you? Well, I traveled like 5000 miles to finally get here. I was really excited about my 5th visit to my favorite spot in seattle. Then like a child walking into disney land for the first time, I asked for my stuff: Roast beef sandwich with gravy and an a mandatory Ale. How disapointed I was….The tattooed girl asked my for an ID, which I didnt have with me at that moment. It was like: Mickey mouse took the day off son…Daffy duck too¡ Wanna see the little mermaid? Regular coke please. I sat…ate my sandwich and left with that sad feeling invading my soul. Why me? Its because I am a tourist? I dont blame the girl…I mean, I am almost 40 years old though, but she was doing her job. Bottom line…bad timing. I still love it anyway. I will never go back to this place. My group (5 people) went here for dinner while the snow was falling in Seattle and our work put us up in a hotel in the area. As soon as we sat down, the bartender (Derek) threw an attitude to us. He was pretty demanding as “happy hour” was ending in 7 minutes so we had better hurry up and order our drinks. I guess he didn’t realize we were sitting there for almost 10 minutes already. He took our drink order and then disappeared for roughly 20 minutes. He then came back and took our order. We got the mediocre food. My partner ordered the chicken fried chicken that wasn’t even cooked through 75%. We couldn’t say anything Derek because he was too busy behind the bar to come over to us. When someone asks for a side of ranch to go with their appetizer, you don’t expect it to come with your dinner after the meal is almost over. The overall food was mediocre at the best, cold gravy and the meatloaf had hard crunchy things in it. Finally when he realized we were done eating, he brought us a check with everyone on one check. We asked if he could split it up for each person and that’s where the trouble started. He said that he could split the check if we would have told him at the beginning. Since we were on an expense account we had to have split checks. He again started with his bad attitude. I tried to explain what we needed to do and he then again repeated that if we would have told him in the beginning he could have done so. I told him that if we can get 5 copies of the receipt that will satisfy our expense reports and we would run each persons card on the one tab. he said that would be okay. When we figured out how much each person was supposed to pay, he threw a huge attitude saying that’s not what he was told and that we need to pay it all at once. I tried to explain to him what we were doing and he told me i need to lose my attitude. I wasn’t giving attitude, just trying to explain. I’ve never been in a restaurant that couldn’t split a check after the fact, even if it might be a little inconvenient for the staff. Having Derek say “I’ve never had to put up with bullsh*t like this IN MY LIFE” pretty much sums up our thoughts as well. We finally just put it all on one card and left, hoping to figure out how to do expense reports after the fact. Again, I will never go to this place ever again. Just received a reply from the owner on my Yelp review… the owner’s reply is basically “Well I wish we could review the customers” meaning he thinks he was there when we were and actually has a problem with us. This just solidifies the kind of a-holes that work in and run this place. Exactly! The owner is just as rude! He thinks that a dissatisfied customer is automatically a bad customer, when in fact it’s the service that is bad. Disgusting service. Even for a big city dive bar, the servers were extremely rude. Maybe I rubbed them the wrong way but I didn’t deserve the treatment I got. Maybe it’s because I’m not a tattooed alcoholic or a scummy addict.